5 new resources for screening programs, available now! You asked, we answered. Last summer we asked users which aspects of ASQ® screening they struggled with the most, and now our team has used the results of that survey to improve the offerings on agesandstages.com. This month, we rolled out brand new website features to help you plan better, train more efficiently, and connect with other users more easily. Here’s a walkthrough of each of the five new online resources you have full—and free—access to. This easy-to-follow, step-by-step guide outlines the four phases of the developmental screening process (and the steps of each phase), and provides links to free resources to help you plan and enhance your own ASQ program. Organized by phase. 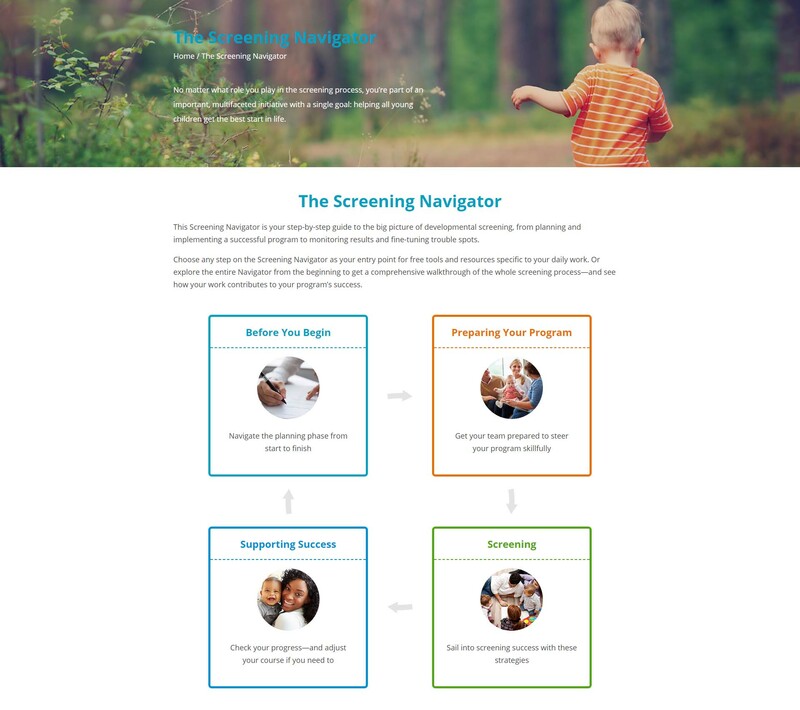 Provides “big picture” descriptions of each phase of developmental screening—Before You Begin, Preparing Your Program, Screening, Supporting Success—and a brief overview of the key steps in each phase. Two ways to use the Navigator. Skip straight to the specific phase or step you want, or explore the entire Navigator from the beginning to get a comprehensive walkthrough of the whole screening process. Tools and resources. With each step we offer links to tools and resources that support that part of the screening process. Free, of course. Introduce ASQ to staff and get continued training support. The Training Portal makes it easy to acquaint your team with either ASQ®-3 or ASQ®:SE-2 in a thorough, straightforward manner and easily cover key topics. To access the Training Portal, you’ll be asked to register for the ASQ website by providing your name and contact information. Lots of resources. Including presentations, activities, and handouts—and they’re all free! Great introduction to the basics. 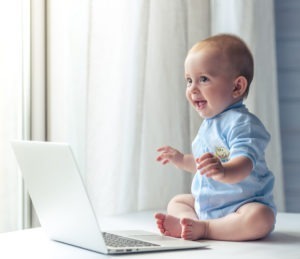 Users will learn the fundamentals of effective developmental screening, including background information, benefits, step-by-step administration instructions, scoring, family engagement, and technical data. Group training printables. Download and print sign-in sheets, name badges, certificates, and more. 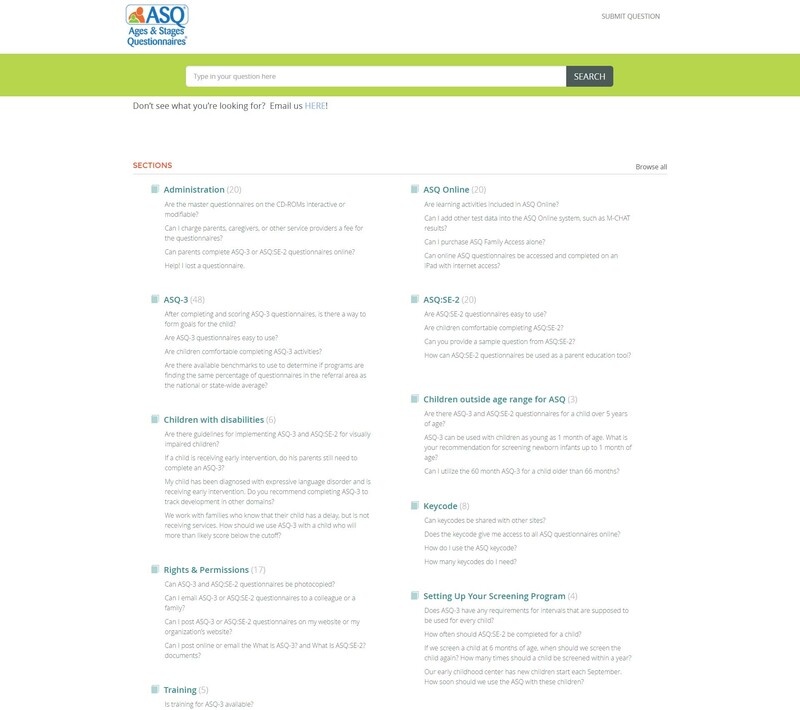 Your one-stop source for answers to common questions about everything ASQ. We’ve received a lot of questions over the years, and have catalogued them here to benefit all users. Easy to use. Categorized by tool, topic, and keyword for easy browsing. Submit your own question. Can’t find the answer you’re looking for? Fill out a quick online form to submit your own question. We’ll answer it within a few days and it may even get posted to our Knowledge Base! A section on our site written in family-friendly language to help them understand the purpose of ASQ screening and learn what to expect from the process. It’s a great resource to share with families when you’re introducing a questionnaire for the first time. Q&A format. Gives parents quick answers to some of the most commonly asked questions about how ASQ screening works. Valuable resources. We link to resources we’ve developed for parents to help them support their child’s development. For example, our popular parent activity sheet handouts. Peers can be a valuable resource when it comes to idea-sharing and problem-solving. Now you can easily connect with other ASQ users who work with similar populations. 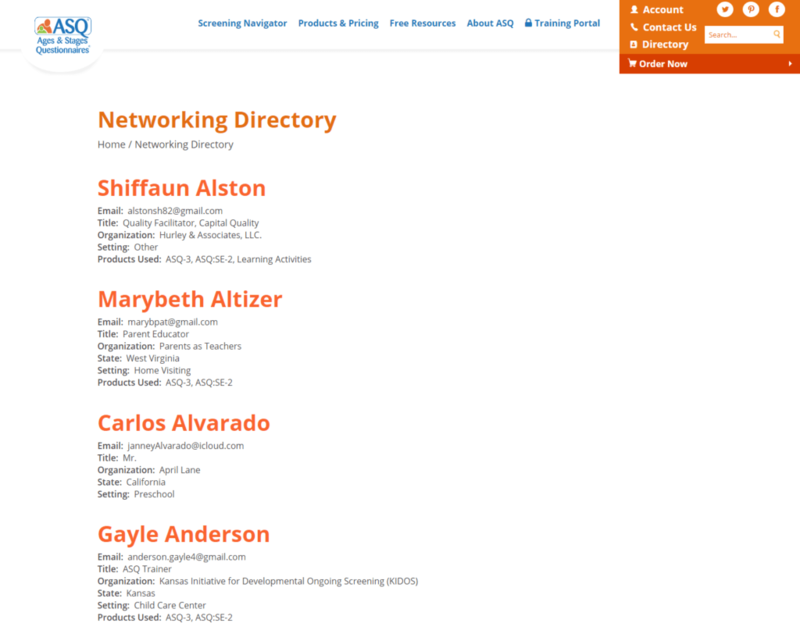 To access the Networking Directory, you’ll be asked to register for the site by providing your name and contact information. Easy to join. Simply enter your organization name, type, and address, as well as what ASQ products you’re using and your contact information. Easy to search. Members can search by keyword, or filter results by state and organization type. Unlock the full potential of agesandstages.com! 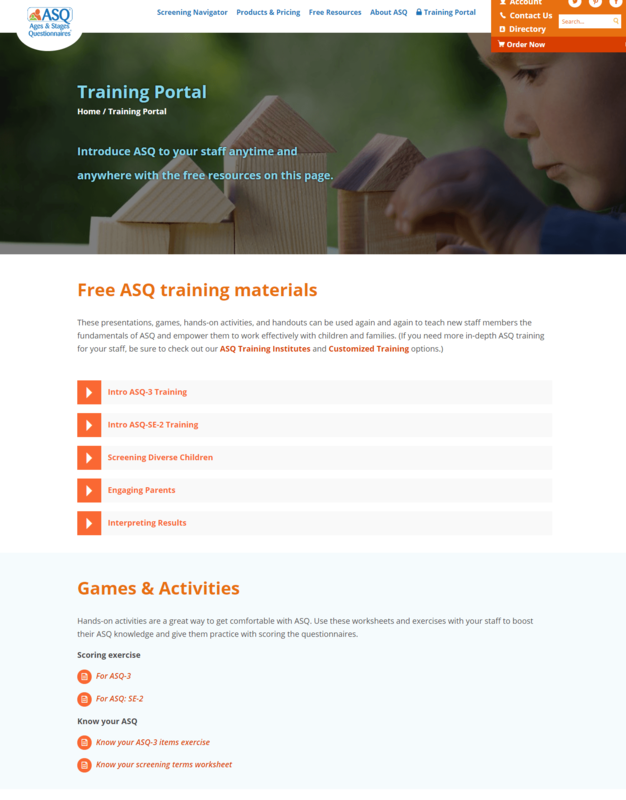 Registering for the ASQ website allows you to access exclusive features, including the Training Portal and Networking Directory.